The past is best left in the past? When I was a young lass (in the 80’s and even into the 90’s when I wasn’t quite so young anymore but still didn’t feel as creaky as I do now) Ben Elton made me laugh. His TV writing made me laugh ( specifically Blackadder). His stand-up made me laugh (he toured here a lot, I presume due partly to his Australian wife). His books made me laugh. I laughed at his observations about the world and I enjoyed his take on ‘big issues’ that are important to me like the environment. To be honest the knob gags always annoyed me after a while but nobody’s perfect. This week, completely without planning the two events to coincide, I read Ben Elton’s latest book Meltdown and watched his new show for Australian TV Live from Planet Earth. Neither of them made me laugh. At all. 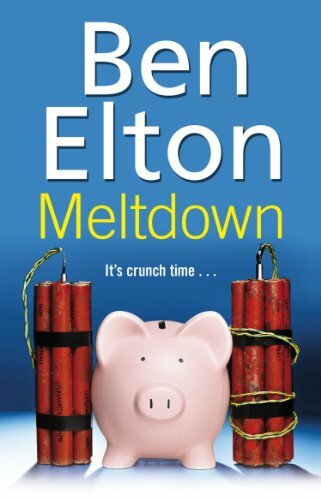 Meltdown is about 6 friends from university who are various shades of stinking rich. One is a futures trader, one a bank CEO, one an MP, one a purveyor of utterly pointless but really expensive ‘gifts’ (e.g. a single olive in a beautiful container for £10) and the other two were things I have forgotten (since finishing the book yesterday which might give you a hint of how banal it all was). Then the global financial crisis hits and their respective worlds all fall apart as they become stoney broke and/or social pariahs. The plot was entirely predictable and I’d heard all the jokes before (seriously, I can remember sitting in the particularly uncomfortable Her Majesty’s Theatre laughing at the exact same ‘communal fridge in a shared house’ joke he made here). 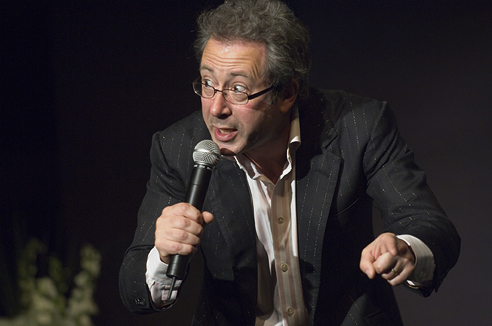 While the book was boring and unfunny Ben Elton Live From Planet Earth was a whole different grade of awful. I lasted through 40 minutes of the hour-long show and that was probably 25 minutes too many. The stand-up was a cringe-inducing mixture of knob gags and ranting about young people using the internet too much. The sketches were too long and highly derivative (of, among other things, his own previous work in The Young Ones, of Monty Python and of an Australian TV character from the late 80’s called Kylie Mole). The entire sad and sorry thing reminded me that the things that made me laugh when I was a teenager are just not funny any more but apparently Elton doesn’t feel the same way. What I learned from this experience is that it’s usually best to leave the past where it is. I should have kept my happy memories of the way Elton used to make me laugh and not tried to re-live them. Instead of the angry and funny young man I remember I’ve got new images of a disgruntled old man raving about things that nobody cares about like body art and the internet. He’s lost the wit and the incisiveness and the being in front of the pack on big issues (His 1991 novel Gridlock was ahead of its time in poking not so gentle fun at our obsession with the motor car and how it will probably be our downfall as a civilisation). He’s still got the knob gags and the obsession with poo but it’s not enough. Not nearly enough. 8 Responses to The past is best left in the past? Like you I think he was quite funny as a stand-up years ago – in the pre-internet era when it was harder to sample a wide range of talents. He was critical of the then-seemingly endless Tory regime. I did read a couple of his novels when he first switched to writing, but I did not like them either. His one-liner approach just did not translate to books. They did very well over here though, or at least the first few did. Bernadette – It is interesting how our tastes and perspectives can change over time. As I read your post I was thinking of several comedians who I thought were hilarious when I was young but now? No. I think people do grow and change, and so should the art (whether it’s music, visual, written or something else) that they create. Sorry that you were disappointed and I empathise – that’s happened to me, too. Well, but Blackadder WAS fun. It’s like musicians who don’t know when to quit! I just saw today that Ben Elton’s Australian TV series has been cancelled after 3 episodes. Prescient as ever, Bernadette!